If you’ve made a resolution to hit the gym more, now that the New Year has rolled around, then you might be looking for a new gym wardrobe to give you the motivation to keep going and look good while you do. But, if it’s your first time training regularly, you could be wondering what should you wear in the gym? A general rule of thumb is always to go for clothing that you feel comfortable in, so think more elasticated waistbands and loose t-shirts and less tight fitting garments. Make sure things aren’t too loose on you though either, as you run the risk of them getting in the way. Lightweight t-shirt/ athletic tank top – these should be made from a breathable material such as cotton or polyester, or even better, a material that will help wick the sweat away from your skin. Sports bra – it’s always a good idea if you’re female to invest in one of these. And they’re not only useful for the larger cup sized women. If you’re doing any cardiovascular or high intensity workouts, this will keep you more comfortable. Flexible bottoms – this can include tracksuit bottoms or shorts (which shouldn’t come below the knee), yoga pants and cycling shorts. Lightweight socks – again these should be flexible and made from a breathable material. Not too tight or loose either, because after a while they will become uncomfortable. Appropriate footwear – invest in a decent pair of trainers and if you’re going to be using the treadmill or doing aerobic exercise a lot, perhaps buy some that are good at taking impact. Hairband or cap – these can be useful for keeping hair away from your face which would make you feel hotter and more uncomfortable. Clean towel – especially if you’re likely to sweat a lot, as, not only will you be able to wipe your face to keep you cooler, but you’ll also be able to wipe down the equipment if necessary, once you’ve used it, and leave it ready for the next user. Clean workout gear – you might not mind your own personal smell, but wearing something you have worn a few times to the gym without washing, may give off an unappealing aura for other users. 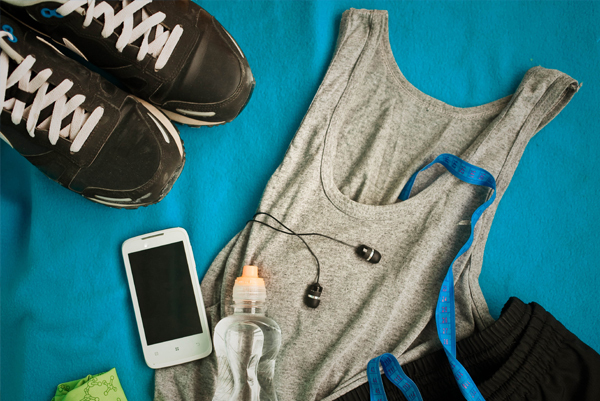 Earphones – because, if you want to listen to your own music while working out, it might not be to everyone’s taste! If you’re thinking about joining a gym, then at Physfit we are all ready and waiting to make you feel right at home. With fully qualified personal trainers, friendly and professional staff, bang up to date equipment and of course our lovely members, we’ve got the perfect place to start your fitness journey in 2017. To find out more, give us a call and book your free induction today.